This guide will explain you how to deal with PHP libraries and their dependencies using Composer and how to combine this tool with Buddy’s features to set up a continuous delivery pipeline for your PHP-based projects. Explain you the core features of Composer. Outline the development process with Composer and indicate possible benefits. Describe the delivery automation with Buddy and Composer. The external libraries you’re using are added to the project repository and pump up its volume, which causes maintenance problems. Updating the libraries is extremely time-consuming, as it requires downloading up-to-date versions to the repository and committing all the files. You need to set up an autoloader for each library manually. Composer solves all the above problems with one configuration file, storing the list of libraries and their versions. Upon issuing the composer install command all the libraries are downloaded in adequate versions and Composer automatically creates an autoloader that links them. You keep only one configuration file in the repository, instead of all the libraries. Updating libraries to its new version requires a change in the configuration file and calling a method composer install. Every new library added to the configuration file is ready to use after executing the composer install command. Let’s take a look at the development process with Composer in place. For this project create a new folder sample_project. Now we’ll add our first library to the project. This library will log the IP number of a person opening the website to an external file. If you’re using Composer for the first time, install it on your machine. This command creates composer.json file that stores project configuration with libraries’ names and their versions. The file is located in sample_project folder. This command adds a new entry with the information that the application is using monolog/monolog library to composer.json file. Composer refers to packages repository. The default repository is https://packagist.org/ where you’ll find all the popular PHP libraries. This command downloads the libraries in adequate versions according to the instructions in composer.json file to vendor folder and generates autoloader—/vendor/autoload.php. To employ the library defined with Composer simply declare its use. The code below presents the way monolog class is declared and used in the index.php file (hello world site). Composer.json file should be placed in the repository, and vendor folder, where the libraries are installed, in .gitignore. With such configuration all the libraries will be installed in correct versions on the local machine for everyone who checks the repository out and executes composer install command. There’s no need to keep the libraries in the repository. Uploading application files to the server via FTP. Running the composer install command on the server via SSH. Completing these steps manually is time consuming and—what is typical for manual processing—very error-prone. Fortunately there’s a way to automate the tasks with Buddy and its pipelines. Click Add a new project. 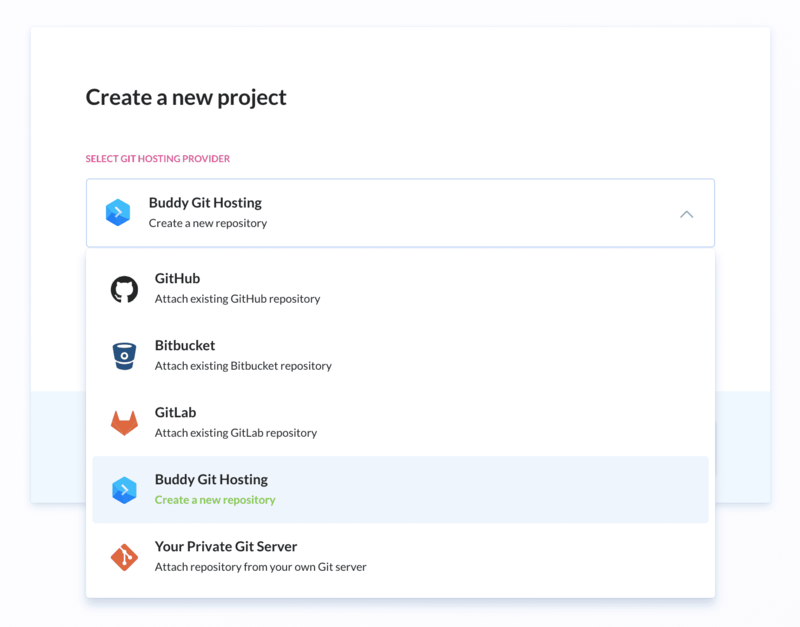 Pick Buddy as your Git hosting provider. Now we’ll take care of the pipeline—a tool that defines steps to be performed automatically by Buddy. First, add a pipeline that will deploy changes introduced to the repository to the production server whenever you trigger it. One that will upload the source files of your application to the server. In Buddy you can choose from numerous uploading options, like FTP, FTPS or SCP. In this example we’ll use FTP. We need to enter the authorization data and the upload path. Another one (ssh action) that will run the composer install command on our server. This command downloads the libraries to the production server and generates autoloader, just like in case of the local machine (see the explanations above). And we’re done—the pipeline will deploy the application when you run it with one click and run the composer install command on the production server—you don’t have to do it manually. You can also employ pipelines to deploy to other servers, like development or staging server. To read more about this approach, click here. We’re done—Composer is managing our libraries and dependencies and Buddy deploys the changes to production server. This is just a brief summary of what Buddy offers regarding Composer. If you are interested in our solution, you can read more about Buddy in other guides. If you have any further questions, don’t hesitate to contact us at support@buddy.works or simply register for the trial version and have a look at Buddy. Deploy websites and run Composer on a single click or push to Git.